Sapura E&P is proud to have one of the best production track record in Malaysia with a best-in-class platform uptime of above 98% Overall Equipment Effectiveness (OEE). We also continue to exceed our production targets on a year-on-year basis. An active facility debottlenecking and upgrading programme at all our platforms allow production at each platform to exceed its original design. 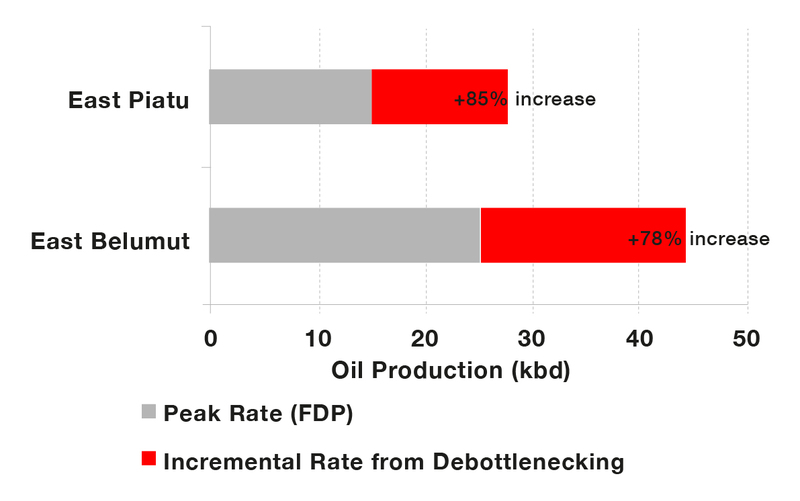 This innovation has resulted in as much as 85% above-expected production rates in the original Field Development Plans (FDP) at East Piatu and East Belumut, hence achieving a peak production rate of 75,000 barrels/ day in 2012. Our production accomplishments include installation and operation of the first heated pipe-in-pipe system in Malaysia for very waxy crude handling at Puteri. This has enabled continuous production at Puteri without incident since 2011.